Cairo Santos was placed on injured reserve by the Chiefs Tuesday, with the veteran kicker slated to miss at least eight weeks with a training-camp groin injury that has lingered into the season. 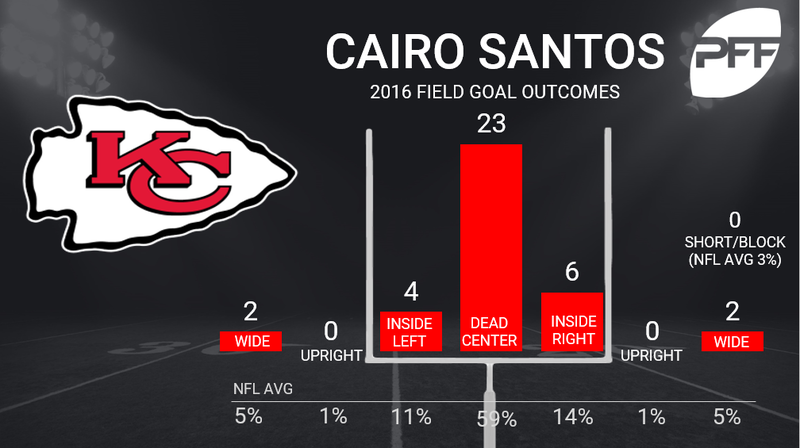 Santos, who beat out incumbent Ryan Succop in 2014, has finished 26th, ninth, and 14th in our grading for field goals and extra points in his three seasons, missing only four field goals a season ago. The Chiefs signed Harrison Butker from the Panthers practice squad to replace Santos. Butker graded about average a season ago on field goals and extra points for Georgia Tech, but was our sixth-highest-graded kicker in terms of kickoffs, producing 54 touchbacks on 73 attempts.